About "Percents greater than 100 and less than 1 worksheets"
Percents greater than 100 and less than 1 worksheets much useful to the students who would like to practice problems on "Percentages"
In the fraction 17 / 5, the numerator is greater than denominator. So the fraction 17 / 5 is greater than 100%. In the above calculation, the fraction 17 / 5 is equal to 340% which is greater than 100%. Let us look at the next problem on "Percents greater than 100 and less than 1 worksheets"
In the fraction 7 / 25, the numerator is less than denominator. From the above point, all we can conclude is, the fraction 7 / 25 is not greater than 100%. It may be either between 1% and 100% or less than 1%. To make sure of the category, let us convert the given fraction into percent as given below. In the above calculation, the fraction 7 / 25 is equal to 28% which is between 1% and 100%. In the fraction 3 / 8, the numerator is less than denominator. From the above point, all we can conclude is, the fraction 3 / 8 is not greater than 100%. 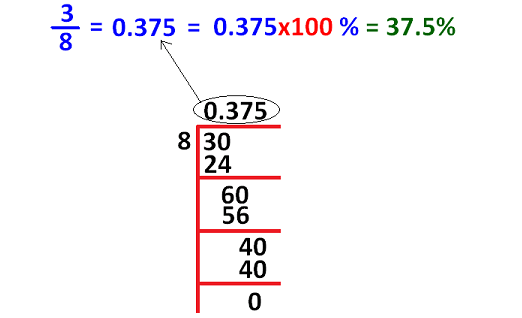 In the above calculation, the fraction 3 / 8 is equal to 37.5% which is between 1% and 100%. In the fraction 13 / 8, the numerator is greater than denominator. So the fraction 13 / 8 is greater than 100%. 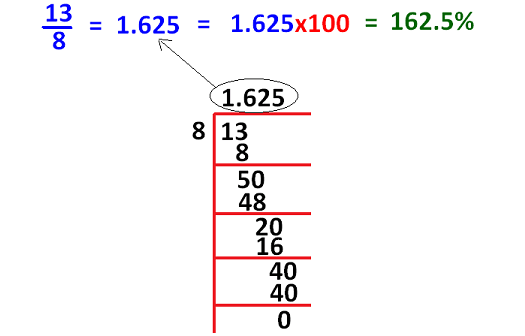 In the above calculation, the fraction 13 / 8 is equal to 162.5% which is between 1% and 100%. In the fraction 3 / 800, the numerator is less than denominator. From the above point, all we can conclude is, the fraction 3 / 800 is greater than 100%. 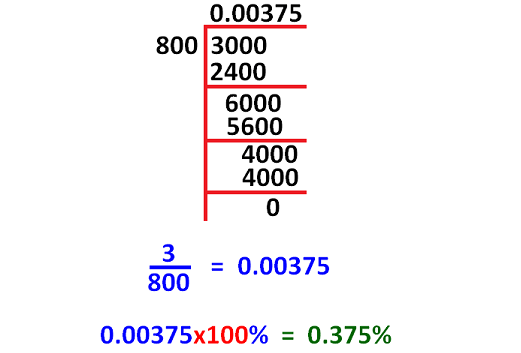 In the above calculation, the fraction 3 / 800 is equal to 0.375% which is less than 100%. The value of the given decimal is greater than 1. In the above calculation, the decimal 2.742 is equal to 274.2% which is greater than 100%. The value of the given decimal is less than 1. To make sure of the category, let us convert the given decimal into percent as given below. In the above calculation, the decimal 0.2742 is equal to 27.42% which is between 1% and 100%. In the above calculation, the decimal 0.0032 is equal to 0.32% which is less than 1%. In the above calculation, the decimal 0.0.032 is equal to 3.2% which is between 1% and 100%. In the above calculation, the decimal 0.0.32 is equal to 32% which is between 1% and 100%. If you need any other stuff in math, please our google custom search here.